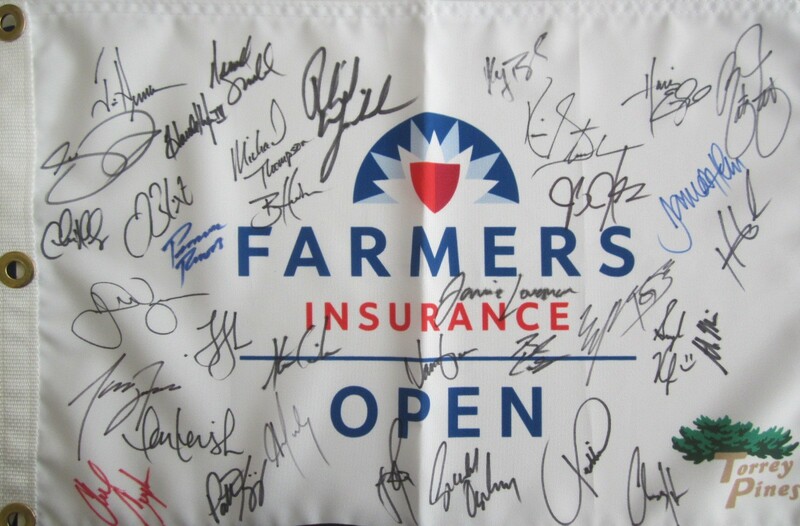 2016 Farmers Insurance Open golf pin flag autographed by 33 players from this event played at Torrey Pines in San Diego including tournament winner Brandt Snedeker, major champions Phil Mickelson, Justin Rose, Lucas Glover, Geoff Ogilvy and Stewart Cink; plus Marc Leishman, James Hahn, Kevin Streelman, Smylie Kaufman, Chesson Hadley, Aaron Baddeley, Chad Campbell, Brian Harman, Charley Hoffman, Hunter Mahan, Michael Thompson, Johnson Wagner, Jim Herman, Steve Marino, Harold Varner, Patrick Rodgers, J.B. Holmes, Harris English, Rickie Fowler, Patton Kizzire, Jonas Blixt, Freddie Jacobson, Tony Finau, K.J. Choi, Jason Gore, Bud Cauley and Jamie Lovemark. Obtained in person by me at the tournament. 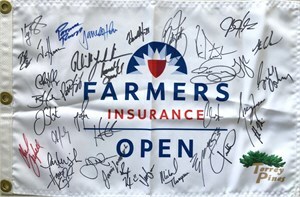 With certificate of authenticity from AutographsForSale.com and list marked with all the players who signed this flag. ONLY 2 AVAILABLE FOR SALE.